Go ahead. Google "library themed wedding" and 90% of the context will be my wedding. Scott has had massive emails asking how this came about and I would love to share our story. We married one year ago in March, and this is the perfect way to show you how it was done. It's way too long of a process to tell you all in one post, so I'll be doing series of it. This is the post of our invites. I didn't want the typical wedding where we have one or two original elements. We wanted everything to be different. We brainstormed every type of wedding and our creativity kept returning to a library theme. We loved reading, academia, and of course, libraries. Our biggest challenge was not choosing the theme, it was choosing the invites. My mom has an amazing, amazing, a-mazing hand and volunteered to do each invite by hand with calligraphy. I loved the idea, very romantic and timeless, but as our wedding guests went from 100 to a 300 + guest list, it was too much for her. Plus, she was already hand making my wedding dress. I wanted her to concentrate on that instead. We wanted our invites to fit the theme, but of course, for me, on a personal note, the pressure of pleasing people always arises at the times you don't need it. I wanted something original but with 80 million ideas, I couldn't concentrate. Of course, Scott came to the rescue and suggested we make our own and have it fit our themed wedding. 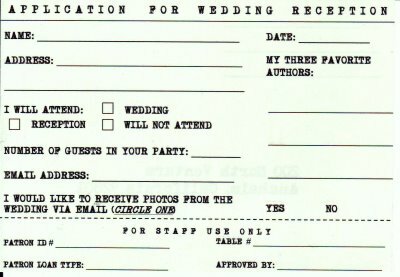 Instead of a regular RSVP, we made our guests fill out an "application form" as if they were applying for a library card. Scott found a cool font online to download and used it for our invites. We used thick paper, and printed everything ourselves from his printer. 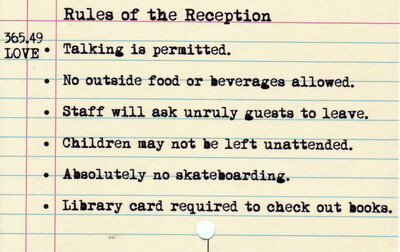 we even had "rules" to make it more legit. We didn't find paper like this, we made it ourselves and crossed our fingers it would work when it printed and it did! We just bought thicker paper so it won't be too easy to bend in the mail. on the map, we had a quote from Rudolfo Anaya. We found it very appropriate! 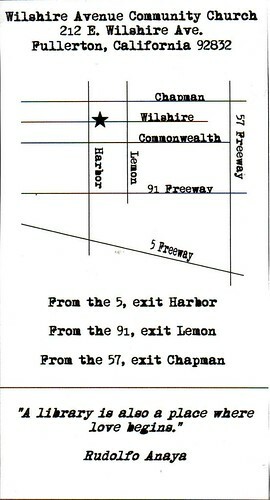 this is how the whole invite looked once it was put together. My parents made us a custom embosser and help from friends and family to emboss each pocket. 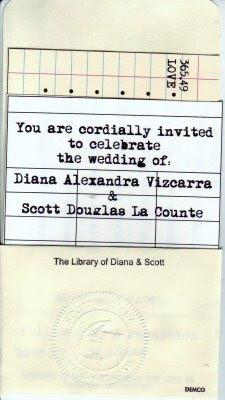 we also had a stamp made that said "the library of scott and diana". We ordered a stamp that said "Library Mail" and I had a few guests tell me they thought the invite envelope was an overdue notice from their library. Even the lady at the Post Office warned me half of my guests will possibly throw it out because it looks nothing like an invite. Well, that is the whole point, but thankfully, no one threw out any invites. The envelopes were basic tan colored business envelopes and we used the font we found to address them.We also embossed the front of the cards and envelopes with our first initials to give it a more dated look.It really wasn't to hard; we got the actual slips from a library supply company (I think it was Demco) and used card stock, custom made rubber stamps, and a paper cutter as are only other supplies. Scott used Word to create the cards themselves...it's nothing more then a Text Box with lines...Hope that answers some of your questions! I'll be posting more deets of the wedding soon!